Taking Flight: Snowy Owl, Bluebird, Saw-whet Owl and Canada Geese OH MY! Snowy Owl, Bluebird, Saw-whet Owl and Canada Geese OH MY! Patients are coming through the door rapidly now. They are of every shape and size and keep our life interesting with their diversity of species and medical needs. 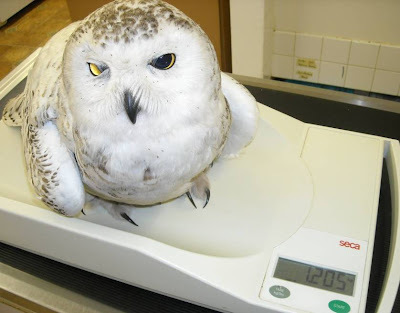 A beautiful adult Snowy Owl was admitted on Wednesday. She is thin weighing less than half her normal weight. She is blind in one eye. Her blindness may have played a role in her level of starvation. We do see Snowy Owls in Wisconsin some winters, but this date is too late for her to be here. She should be settling into breeding with her mate in the tundra near Churchill, Canada. Her prognosis is not good to recover from her multiple medical problems, but we have seen miracles before here at REGI. Our rule of thumb is if she is fighting to stay alive we are willing to do our part to help her recover. We will continue to tube feed her oral emaciation diet and give her sub-q fluids. She was found by some very caring people that wanted to make sure she had the best chance at life. As so often happens, without members of the public calling to alert us to emergency situations we would never have the chance to help. 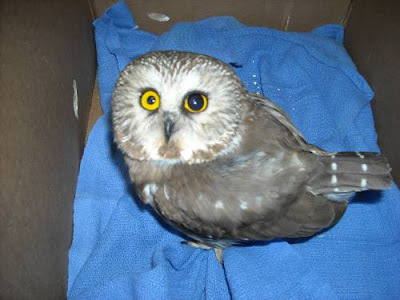 We also admitted an adult female Saw-whet Owl yesterday. How odd we are seeing adult patient this time of year when babies are more the rule. This owl has a brood patch which means she was sitting on eggs before she became ill. She is blind in one eye. Her blindness could be due to a head injury as she has a small patch of feathers in an odd shape on the back of her head. She is doing much better and I hope we can get her home soon. 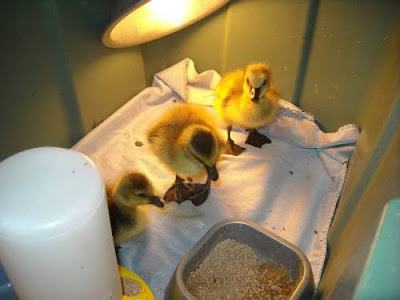 Three lovely goslings admitted from the Marshfield area. They are lively and doing well. We are have some cold weather again this week, but they were able to spent a short period outside in the sun. 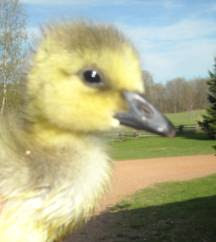 It is funny to see the Canada goose goslings at a few days old so much smaller than the Mallard ducklings that came in about 2 weeks ago. It always amazes me how fast they grow. There is something about baby waterfowl that brings joy just to watch them in their excitement and interaction with each other. 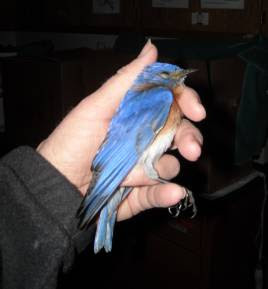 A male Bluebird came in late this afternoon. He is very thin and has pneumonia. I suspect he ate some worms that had been sprayed sometime earlier this week. Life is hard for insectivores. If there are plenty of insects we are often out spraying them or the grasses where they live. Secondary poisoning occurs so often to these beautiful birds. This time of year it is a double problem as Bluebirds like many other species have young in the nest that depend on the adult being there. The lose of an adult at a nest could cause the entire nest to fail. We have so many great updates! The Bald Eagle with the head injury from Neopit is now in a flight. She is recognizing her surroundings better. She is not yet flying and while that is a concern she has time to recover. Dave Koch volunteered two days this week doing repairs on the middle mews. Dave has volunteered at REGI for a number of years. 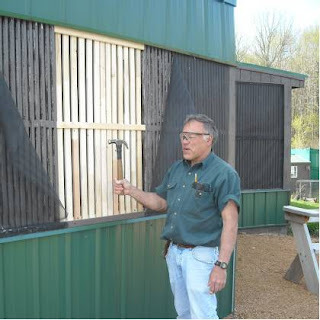 He is one of those people that can do anything in terms of repairs or carpentry and is a wonderful help and a blessing. Dave wrote me a few weeks back to ask if we had any volunteer labor jobs available. I think my email back to him was one word, YES! No sense wasting time writing a bunch of words when an enthusiastic YES will do it. E. O. Johnson Co. has begun our technology transformation. We are all like a group of children staring big eyed at the incredible equipment and changes they are making to our computers including networking. While we are up to date on biology and medical issues, technology other than the most basic was always too far a reach for REGI as a non profit. Winning this makeover means more than even we knew. That is just part of our news. I will have to catch up more tomorrow. I am off to feed babies one more time before catching a few hours of sleep. The Sandhill colt gets me up at 3:00 A.M.and then again at 5:00A.M. if I am not already awake.